Not everyone grows wisdom teeth, but for those that do, there may be certain oral health complications associated with them. Humming Bird Dental Studio in Richmond Hill provides wisdom tooth removal services. Wisdom teeth are often problematic when they are retained or impacted instead of growing normally like other teeth. The presence of a third molar is more likely to cause a periodontal disease as you age. We advise on the removal of wisdom teeth early rather than waiting until periodontal disease starts to develop. If you have had periodontal diseases before, along with other factors such as level of dental hygiene and age, you may develop more serious problems from wisdom teeth. Our experienced team of professionals can advise on the correct dental hygiene practices and care your teeth need in order to recover from or prevent these periodontal diseases. Besides periodontal disease, tooth decay is also common for people with a third wisdom tooth. Above the age of 25, there is greater risk of postoperative illness after wisdom tooth removal surgery. The earlier you get wisdom teeth removal Richmond Hill, the better your chances of full recovery and reducing the risk of dental disease. The full procedure will be at our offices in Richmond Hill. Before we start the extraction process, we need to ensure there is no infection present to prevent it from seeping into the blood stream. Therefore if you have experienced swelling or pus pockets around your wisdom teeth, we need to deal with the abscess first and ensure the infection is cleared before extraction. We use a local anesthetic in the area around the wisdom tooth to numb it. In case we need to remove more than one wisdom tooth, we will use general anesthetic. Avoid eating or drinking after midnight the day before the surgery in preparation for the anesthetic if we need to use a general anesthetic. 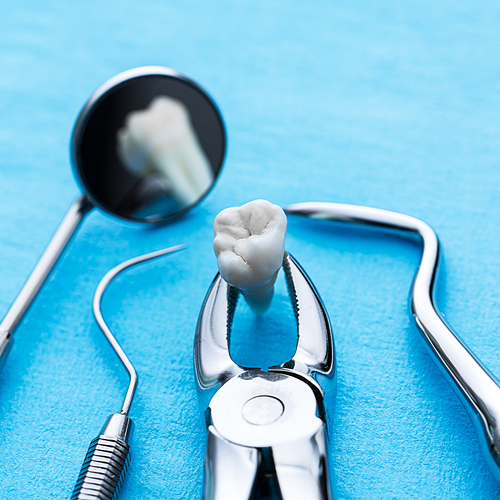 The extraction process involves more than simply pulling out the tooth. The dentist opens up the gum tissue that is covering part of or the entire tooth as well as any bone. They will also separate the tissue that connects the tooth to the bone before pulling out the tooth. Sometimes wisdom tooth need to be cut to smaller pieces to remove. After removal the surrounding gum tissue is stitched into place and the stitches will dissolve over time. It will take you a couple of days to recover from wisdom teeth removal in Richmond Hill. We will prescribe painkillers to help manage the pain at this point. The bleeding from the surgery should last for only a couple of hours after. In case your gum still bleeds 24 hours after surgery you should call us immediately. Using an icepack on the outside of your cheek will also numb the pain and reduce bleeding after extraction. Eat soft foods and more fluid to prevent irritation on the stitched area. We will prescribe medicated mouthwash to use during the recovery stretch.